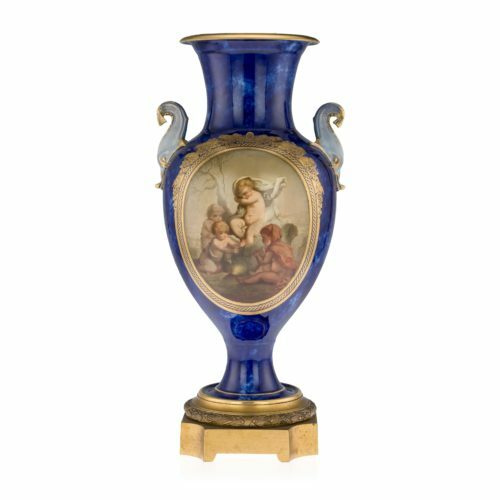 A Sèvres gilt-metal mounted 'lapis-lazuli' ground vase, circa 1866. Applied with dolphin handles heightened in gilding, the ground reserved with a medallion depicting four putti crouching around a fire in a rocky landscape, signed S. Baldisseroni 1866 l.r., surrounded by an elaborate gilt cartouche, 50.5 cm high. 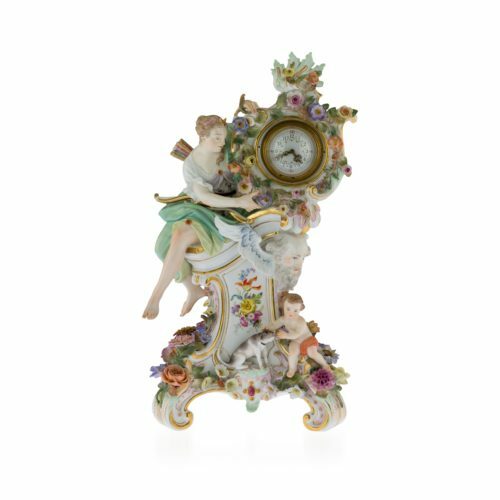 A Meissen Mythological flower-encrusted clock, circa 1880. A Meissen group of Venus Rising, circa 1880. 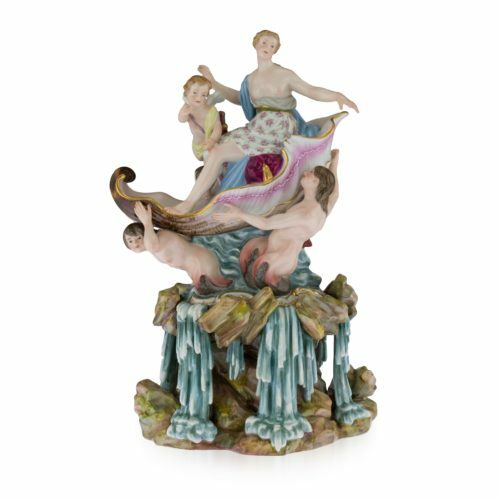 After the model by J.J.Kaendler, the figures of Venus accompanied by Cupid seated in a shell supported by three Triton, rising from the sea, the rocky base applied with waterfalls from the current, 34.5 cm high. 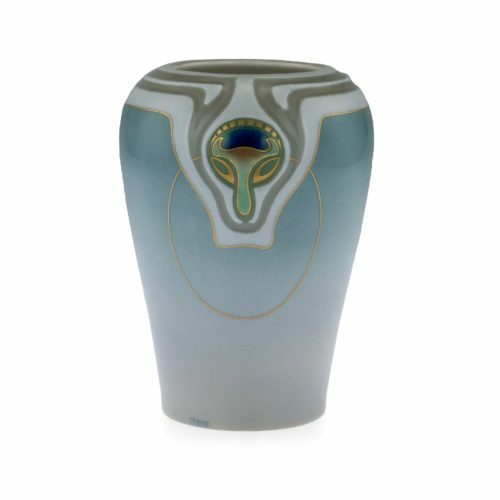 A Meissen extremely rare Art Nouveau vase by Otto Eduard Voigt, circa 1905. Finely decorated with three lustrous enamel roundels of peacock feather detail reserved on a varying incised and raised surface, painted with high-temperature colours and heightened with stylised gilt detail, signed O.Voigt, 16.5 cm high. A very complicated combination of techniques. Otto Eduard Voigt (1870 - 1949) worked at Meissen 1896 - 1932. From 1904, he worked in the 'underglaze' department. Many of his designs were also used in the production of tea, coffee and dinner services. Specialising in Meissen, KPM Berlin, Sèvres, Vienna and other fine European porcelain and objets de vertu. Exhibiting a diverse range from the 18th, 19th and 20th centuries.